We’re all different. Different experiences, different perspectives. We’re at different points in our lives. As the kids I know say, it’s all good. I’m not young or, rather, not as young as most of the tech-online-wired crowd. At times, my body reminds me that I’m aging, but I definitely don’t feel old (whatever ‘old’ is exactly). I didn’t grow up reading blogs or surfing the net. My first exposure to email was at work years after finishing college. While there, I took one course in programming, which involved a tall stack of punch cards and a card reader half the size of my current SUV. I typed all of my college papers, consuming mass quantities of carbon paper and White-Out along the way. And, by typing, I mean using a typewriter. Do I belong in the blogosphere? Do I – and my generation-mates – belong online using twitter and connecting with people through social networking? Damn straight, we do. I’m saying that to you young kids and to my peers. Let’s get over ourselves and recognize that we can all learn from one another. At this point, I’m becoming accustomed to the vexed looks, complete with raised eyebrows and rolling eyes. (Even online, I can sense when someone is rolling their eyes. I’m that good.) Truth be told, this reaction isn’t limited to younger people. There are plenty my age who believe all of these “tech toys” are strictly timewasters aimed at the younger and easily-distracted generation.? This I attribute to a mix of tech intimidation and lack of practical information about basic online tools (all understandable) and a bit of prejudice (not OK). I also hear many in the younger crowd dismissing the desire and capacity of older generations to venture into the virtual world. For this, I have a more difficult time finding a justifiable explanation. Over at TechCrunch, there is a “spirited” discussion going on regarding a new site called Boomerator, which is aimed at the Baby Boomer generation. What is most interesting – and concerning – are many of the posted comments. Several reflect a perception that “older” people can’t or won’t use the site due to their failing eyesight, reluctance to go online or tolerance to interact with a multigenerational audience. Are these characteristics accurate for some Boomers? You bet. The entire generation? Absolutely not. No sooner would I characterize all twenty-somethings as having or lacking certain values, perspectives or challenges than I would any other group or generation. While I frequently speak about the virtual world, blogging is completely new to me. I recently took a leap of faith, establishing a self-hosted blog using wordpress.org. Suddenly, I’m inundated with new terminology: ftp, html coding, ajax, api keys and plugins. It has been overwhelming. I thought back to when I bought my first car, a light blue 1964 VW Bug with a manual transmission. I’d never driven a stick before, but had no hesitation about making the purchase. I was simply faced with something I hadn’t yet learned, not something I was unable to do. A friend taught me the basics of shifting gears and I was off. Before long, I was able to fix almost anything which went wrong and knew to buy replacement parts at the local Pick-and-Pull. Setting up the new blog isn’t as different an experience as one may think. New friends have generously shared advice and tips to get the blog up and running. Andy Quayle at BlogHost.me has patiently answered questions, although he may rue the day I signed up for his blog hosting service. My many twitter friends, especially Clara Kuo of The Millennium Marketer (@manesaclara), have replied instantly to queries with answers and words of encouragement. If I am going to learn how to manage my blog most effectively, admittedly, I have a lot of catching up to do. With support from those with the experience I lack and the patience to answer very basic questions, I will progress. The proverbial icing on the cake for me is the opportunity to build relationships with these wonderful people, the majority of whom are young enough to be my kids. The opportunity to get to know you on your turf is a joy. Still, if I or any of my Baby Boomer peers once in awhile prefer to spend a little time visiting and sharing experiences with one another, such as on the Boomerator site, I would ask that you not take offense or prejudge anyone’s motives. While I might be welcome to join in a conversation about the impact (or lack thereof) of MTV’s TRL going off the air or the latest iPhone app, I might not be the first person you’d think to approach, and this is perfectly alright. The one thing we all will become, if we are so fortunate, is old. Even when the extended warranty has expired and some of the parts are in need of repair, there is still a long road ahead. Personally, I look forward to traveling beside you – all of you – and sharing our experiences along the way. Now, back to the grind. Have to figure out what this SEO business is all about. Whew…is it hot in here or is it just me? Second: Let’s not forget the ATTITUDE of that highly UNIQUE generation which produced us: always, always, ALWAYS inquisite, curious, relentlessly exploring, and pushing horizons and boundaries and envelops of all kinds. I’m a Baby Boomer too and if I hear of people saying they’re too old for this game I just tell them I’m around the same age they are and it’s never stopped me! I love exploring technology and playing with it but I do feel it’s too easy to hop from one thing to another and not fully understand all of what they’re about. And sometimes things are just fads. But it’s all fun anyway! Awesome post… I think the only one that DOESNT know I’m… um… over 35, is me. heh. This online thing is great, eh? We have alot of similar experiences, it seems… I’ve taken a motorcycle apart and put it back together. I’ll never do THAT again. lol.. and having a good work ethic is actually FUN, huh? I’ll be keeping in touch! @Vincent – So pleased to have your comments. You’re right, we know how to test boundaries and navigate the unknown. @Kathie – Agreed on platform jumping without taking the time to really understand features and benefits of each. Lots of fun, but often pointless. @Sunny – Motorcycles? You’ve got me beat, sister! The VW engine only had about six parts, so there wasn’t much chance of messing things up. Age demographics can be fascinating. In my previous role as a online community advisor, our demographic was an inverted bell curve, we had about an equal number of 60+ and 20- members. In hindsight, I almost wish we had never enabled the age functionality, as I think the distrust it created was more damaging then helpful. When one views community contributions as a standalone, which we had during an extended software upgrade where the age functionality was disabled, many amazing things occurred. And man, were folks ever surprised when we turned the age display back on again. I also found it pretty cool when my mom started teaching folks WinXP at age 73, having only started using a PC at age 70. The thing is, IT knowledge is pretty transitory. My years of experience as a Novel Netware guy dont add a whole lot of value to web2.0 apps… nor does the fact I wrote code in SNOBOL, APL, and a few other legacy languages. Thus whether one is 15, 43, or 85, each day brings new oppurtunities and challenges in tech, and whats cool is the prior building blocks for the most part are not needed. The 15 year old is learning, just as the 85 year old is. About the only real difference tech wise, is between a total newbie, and someone with 2 or maybe 3 years of experience at best. Age doesnt play much of a role tool wise… but life experience otoh definitely shifts things advantageously for the older folks. Once anyone of any age gets over some initial trepidation and jumps into the fray, it truely is amazing what all can be shared. From one baby boomer to the other, hear hear!! Love your blog. Thanks for the nod, Irene. You are on to something here. There is still age prejudice, but finding common ground (not differences) is the best way to establish relationships and social media is a big fat term for learning and sharing. The first lesson anyone learns about the blogosphere is “listening” before jumping in to conversations. The technology is a barrier that makes this tool difficult to “bridge the gap” but that means we are dealing with a smaller group of people with “higher involvement levels.” Maybe that ultimately leads to more engaged conversations. My 74-year old Auntie is taking a course to learn to use computers. She’s learning fast, too! Now when I explain to her things about e-mails and files, etc., she actually understands what I’m talking about. People are willing to learn, generally. But the older generation sometimes hide their self-consciousness and fear of failure behind assumed lack of interest. We have to let them come to it, and help them if we can. You make lots of sense to me, a (somewhat) younger person. I have never had the experience of programming via punchcards, but I do remember the unforgettable aroma of ditto papers being handed out in class. Blogging isn’t just in the purview of the younger generation. The tools to manage blogs are becoming more and more accessible to everyone. WordPress is a great example, with so many themes that you don’t have to learn css; tracking built in, so you don’t have to rely on offsite tracking scripts; and plugins, so you don’t have to hand code widgets. Thus, making posts and changing pages is becoming easier. Maybe the younger generation is too lazy to learn a little coding? We all benefit in the end. The important thing to remember is that there is help when you need it, just like when your friend taught you how to drive stick shift. Do you belong in the blogosphere? Definitely. @Ron – You’re light years ahead of me in tech knowledge, but we share the same perspective that all ages have something to contribute. Your mom rocks! @Betty – Thanks, fellow Boomer! @Clara (my new young and very helpful friend)- We are a perfect example of how people, with very different experiences, can connect virtually and learn from one another. @Napoleon – Didn’t those freshly dittoed sheets smell awful? You are definitely one I’m counting on to help me learn to drive online. I think this post is awesome. From a younger perspective (23 year old recent grad, works for Intuit in the valley, and running a startup on the side) I think it’s dynamite that the boomers are diving head first into this area. Social media marketing is new territory and there’s no such thing as being too late to the game. So ignore the strange glances, the curious online responses and keep at it! I’ll be learning from you all along the way. Irene I think you are spot-on with your analysis of the value of a generation-focused site. No one says that it has to be a Boomer’s only destination on the web, but the idea that it adds no value to the information obtainable on a site that is not tailored to any generation is absurd. Boomers are in a unique generational position — and the generations before and after them cannot always relate or provide the best advice. This is not the same as saying that all Boomers are alike — it is just a recognition of a simple truth that sites like Boomerater embrace. Whether it be from having technology in front of me since I was born, to working IT in an office of fifty-five 60+ year olds. I can see both sides of your post. I’m 33, and I feel I still don’t know everything out there. I try to learn as much as I can, and encourage everyone I talk to to do the same. My dad, who is 60+, is now head of a Graphic Design department, because he asked me every computer question that he could. Now, I go to him for Photoshop tips. My mom, who would never touch a computer or even a typewriter in the past, now searches Google for every cooking recipe known to man. As far as the people in my office, that is another thing, they don’t want to learn, and I feel sorry for them. Either way, they keep me busy, and I still have a job because of them, so I can’t complain. On blogging, I find it to me to be a great thing, and a release. I have never been into writing/reading, but I set aside some time now, and I write what is ever on my mind. I even got my dad in on it too. He wrote a book, and we are in the process of getting it online for him to sell and blog about. And from the post on my blog – ” http://mzampino.com/blog/2008/9/24/paintings-by-ron-zampino.html “, my dad has put his art online. So I find it impressive for anyone born prior to the technology we currently have now that uses and isn’t afraid of it. I would never trade my amazing friends, my wonderful life, my loving family for less gray hair or a flatter belly. As I’ve aged, I’ve become more kind to myself, and less critical of myself. I’ve become my own friend. I don’t chide myself for eating that extra cookie, or for not making my bed, or for buying that silly cement gecko that I didn’t need, but looks so avantgarde on my patio. I am entitled to a treat, to be messy, to be extravagant. I will dance with myself to those wonderful tunes of the 60 & 70’s, and if I, at the same time, wish to weep over a lost love .. I will. I will walk the beach in a swim suit that is stretched over a bulging body, and will dive into the waves with abandon if I choose to, despite the pitying glances from the jet set . It’s so refreshing to see a blog like this! I’m also a digital immigrant. My first job we had typewriters and then word processors. Now life is all about emails, text messages, instant messages, tweets and facebook…. I don’t remember the last time I used the telephone…. Oh, actually I do but it seems like I use the phone less and less as time goes by…. @Carol – Agreed. There is no one way I’d like to connect with others and get information. We find affinity with one another in a variety of ways. @Michael – Another twitter friend and great resource. Very cool that your parents are finding new ways to explore their interests using technology. @George – Thanks for sharing the message. It is very easy to relate to the author’s words. @Hilary – Isn’t it interesting? We’re always on the go, connecting instantaneously. How did we survive before tweets and IMs? 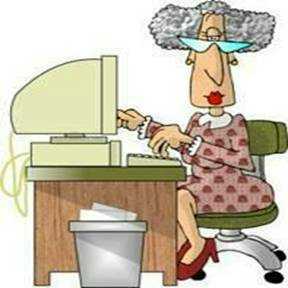 Thanks Irene, it’s all about staying up with technology ..
one of your new Twitter fiends..
Irene… this post is way too funny. I can’t stop laughing. 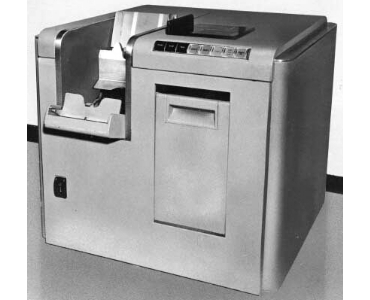 I never woulda thunk that you’d know anything about punch cards or card readers. And a ’64VW. Gee, you must have grown up way early. Anyway, thanks for the post – yep, they think us Boomers are dinosaurs, incapable of being tech-savvy… but they got another thought coming. I have a blog topic brewing around this subject also. I’m going to reference you’re post in it. It is sure nice to stumble upon your wonderful blog. I am a younger boomer, born in ’57; reading AlmostSavvy is so refreshing to me. It is great to know that people my age group are into linkedin, facebook and etc. I have embraced ‘net technology in all its’ glory, esp. for networking. I have already subscribed to your blog, looking forward to more of your writing!